Due to construction please visit the Valle de Oro website for the most up-to-date information on road closures. 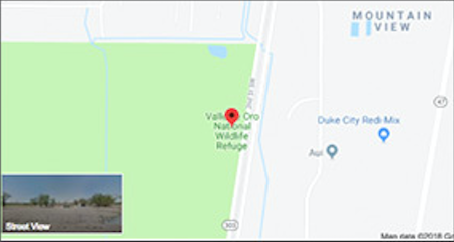 From experiencing and learning about the annual migration of birds to taking a hike through the Bosque, there are many ways to discover nature at Valle de Oro National Wildlife Refuge. Although Valle de Oro NWR is in its infancy and is just beginning its restoration of native habitats and building facilities, you can still visit the Refuge to see wide open spaces occupied by seasonal wildlife including migrating and nesting birds, coyotes, insects, reptiles and amphibians. The 570 acres will continue to be farmed for alfalfa until the visitor center and native habitat areas are built. We are due to break-ground on our visitor’s center in 2019. Feel free to stop by our temporary Visitor’s Center during your visit to meet some of the Refuge volunteers and staff. We are working to engage our community and students during the Refuge’s transition from alfalfa fields to a premier environmental education and outdoor recreation facility. Currently, you are welcome to hike, drive, bike, walk your dog, or ride horses along the farm roads and the ditch banks. At the southwest corner of the property you can access the Rio Grande Valley State Park, hike in the Bosque, fish in the Riverside Drain, and walk to the Rio Grande. Stay on the roads. Please drive slow and respect other road users. Be mindful of farming and wildlife. Keep dogs on a leash at all times. Keeping your dog on a leash prevents them from startling sensitive wildlife on the refuge. Pick up after your dog. Please bring your own clean up bags. Leaving your dog’s waste severely contaminates the water after rains. All storm water drains into the Rio Grande River—keep our river clean! If you see something unlawful, please contact the Refuge Manager. Take note of the date, time, and location of the unlawful activity. Call 505-248-6667.